I live on the windiest corner in Chicago. Seriously. Those pictures you’ve seen of people walking at a 45 degree angle, fighting the wind with hats and scarfs flying through the air? Those pictures were taken outside my apartment! Earlier this week the high temperature was -15 degrees F, -40 if you include windchill. Think of that bone chilling cold on the windiest corner of Chicago. It was rough. This resulted in plenty of time spent inside cooking, baking, reading, and wearing fluffy slippers. My hibernation yielded some tasty food, of course. A highlight was this delicious apple butter. 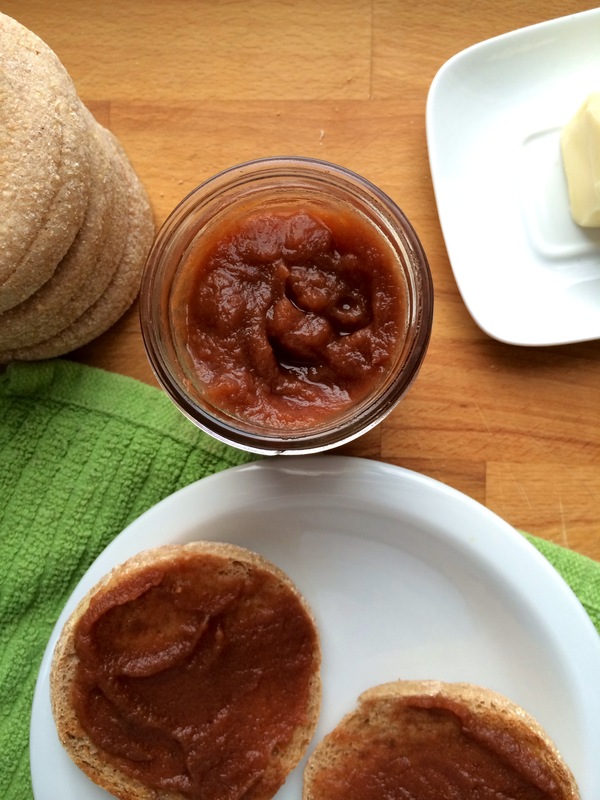 If you’ve never had apple butter before, you must try this recipe. 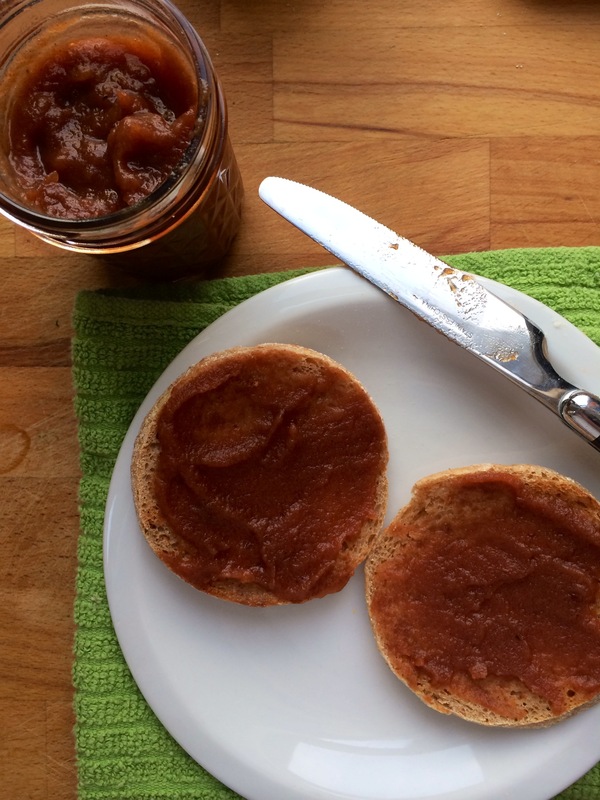 Apple butter is simple. Apples, sugar, and spices cooked way past apple sauce and into a thick, spreadable, jam like consistency. My version is low in sugar and makes a healthy alternative to store bought spreads. 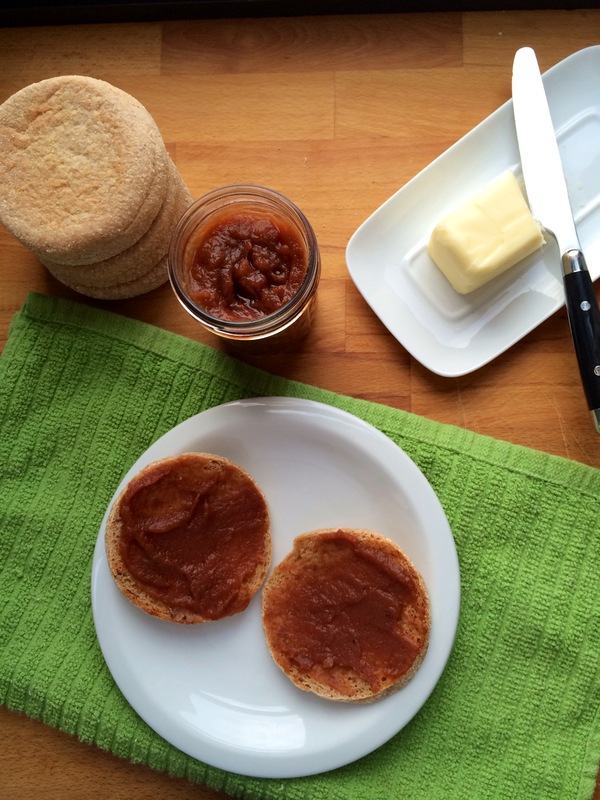 My favorite way to eat apple butter is on a toasted and buttered English muffin (butter AND apple butter…yes!). I also like to mix it into Greek yogurt or warm oatmeal, served on top of pancakes, or heat it up and spoon it onto vanilla ice cream. 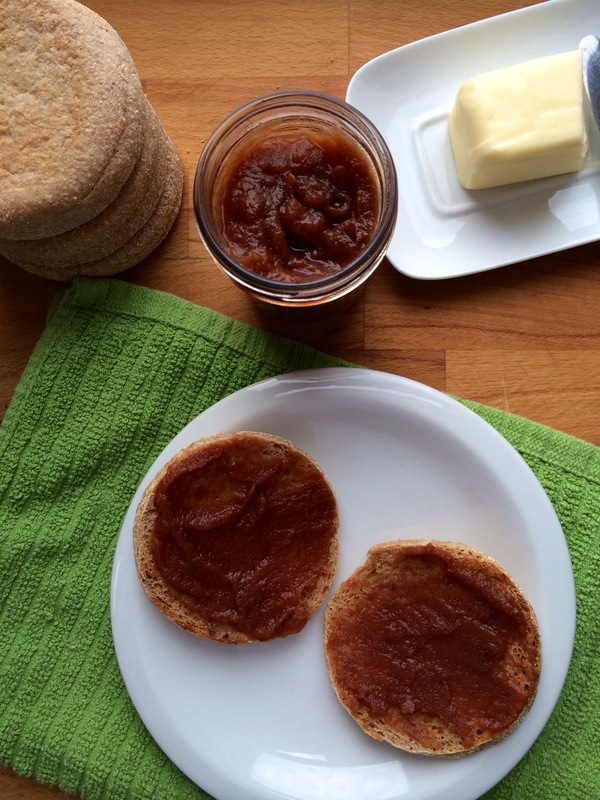 Apple butter, a crusty slice of toasted bread, and a hot cup of tea. It was the perfect snack for crazy cold windy, stay inside, days. Combine all ingredients in your crock pot and stir well. Cook on low for 10 hours. Remove crock pot lid, and process with an immersion blender for 1-2 minutes until smooth. (If you do not have an immersion blender, pour contents into a blender, puree, and return puree to crock pot.) Increase the heat to high and cook for an additional 2 hours with the lid off. This will concentrate and reduce the apple butter. Cool to room temperature, package in an airtight container, and refrigerate for up to 1 month. You may also can the apple butter by following instructions here and store in your pantry for 1 year. Note: The apples for this post were gifted to me from Cardellio Family Orchard. A beautiful private family orchard in Bruce Township, Michigan. I’ve never had apple butter before. For some reason I always assumed it contained butter but now I see it doesn’t at all. I love the colour of this, it looks very rich and delicious.